In addition to the previously examined in our Faltschlössern , today the Kryptonite Evolution is a padlock on the test, 4. The form is to be compared with the letter U. Often, you will therefore also the additional U-Lock. Padlocks told a long time a very high level of security by, but this is still the case, and is also the Kryptonite Evolution 4 a secure bike lock? This question we go the Kryptonite Evolution 4 Test on the ground. The Kryptonite Evolution was delivered in a cardboard packaging, the appearance of packaging make a good impression, you get directly a look at the product. 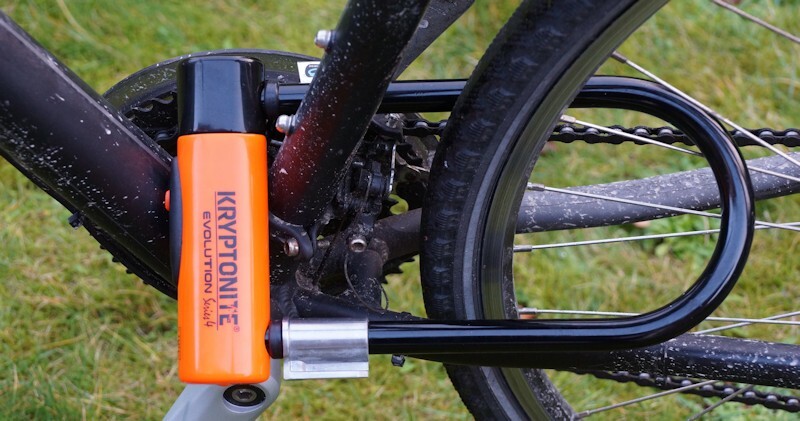 With included are the padlock, the holder for the bicycle frame, 3 bike keys, one of them with integrated LED lighting and a guide to growing the Kryptonite Evolution. From the feel of her, the Kryptonite Evolution feels very valuable to. In order for the bicycle lock will not damage the bicycle paint, it is encircled with a rubber coating. The lock range radiates in an eye-catching orange. It makes its task in accordance with a serious and safe impression. The bicycle lock is about 29 cm long and about 16.2 cm wide. The U-profile has a diameter of about 14 mm. If you are traveling by bicycle, you want to carry around unnecessary kilos with it. The sum of all attachments, this includes the castle, should be kept small. 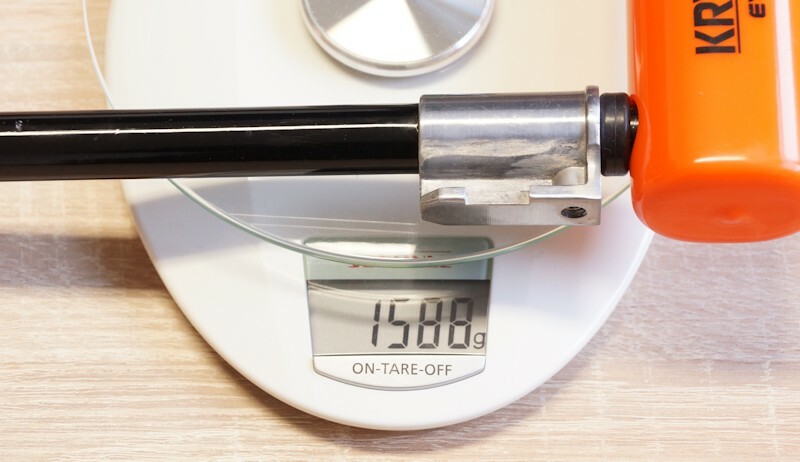 With a weight of 1588 grams of the padlock just is not one of the lightweights. Compared to Faltschlössern tested so far is the U-Lock easier with corresponding design-union differences. Overall, one can say, the lock makes a serious impression conveyed an order, however, a high sense of security. The containing profile bracket can be quite easily attached to the bicycle frame. With a strap that held very small mounting unit of any rod is strapped from the bicycle frame. The belt is supported by a rubber belt. This prevents slipping of the holder. If the belts and the adapter plate on the frame off, now the holder can be attached. Since a position is left itself, the panel yoke is supplied in a rotating structure. If you have found the correct position, preventing small plastic pins rotating the front plate. The included allen wrench is used to tighten the inner screw. The plastic holder now pulls up to the adapter plate, and thus tightens the belt. After having tightened the screw, sits the bracket from Kryptonite U-lock perfectly to the frame. Is the Kryptonite Evolution 4 completely inserted into the holder, it is secured with a spring mechanism and can not fall out by itself. This offers the possibility to attach the bicycle lock not only on the vertical frame bar, an overhead mounting is also possible. If you want the U-lock out of its holder solve, pushes the knob to and can pull it out again. Transported to the bicycle, for example, with a bicycle carrier , the lock but you should take out of the holder. When driving the lock wobbles in the holder a little, but does not cause unpleasant noises.Since all attachments and the Allen key are mitgelifert, an assembly is on the move without any problem. Who as a bicycle frame bag has, can the bicycle lock stowed in this. Since it does not remedy the wheel unfinished, it is not stolen from his pocket. We take the bike lock from the bracket, close it on with the key and insert it from the rear wheel to the bicycle frame bar over. Now we snap into the U-profile and close off the padlock.The rear wheel is now firmly attached to the frame. The same can also be done with the front wheel and the frame. In both variants, we have not yet fixed the bike lock to another object.Bikes without quick release in the front can easily be attached to bicycle racks. The bicycle frame itself can also be connected to road signs or other vertical rods. Would we fix the bike to a bicycle stand or pole, thereby completing the wheels, we partially need an extension, a flex cable. 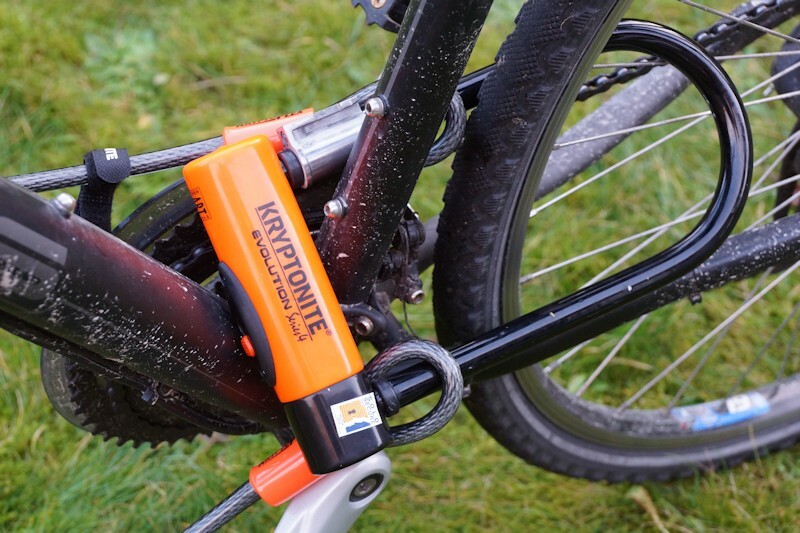 Who now thinks, with a padlock you get problems when connecting the bicycle to a subject who has not heard of loop cable Kryptoflex. Who wants to also enter the front and rear with the castle, can also use the extension for the Kryptonite Evolution, also for the mini version.We have the Kryptoflex ordered us with our test in 120 cm. The two loops of the flex cable are thereby drawn through the two open ends of the U-Locks.Even if the cable is not in the same thickness and strength as the strap, one can hereby give not only a deterrent effect. The manufacturer has a defined security for themselves out of their products. This goes from 1 to 10, with 10 being the most secure level. Based on this scale, one can compare different products from the manufacturer to one another. 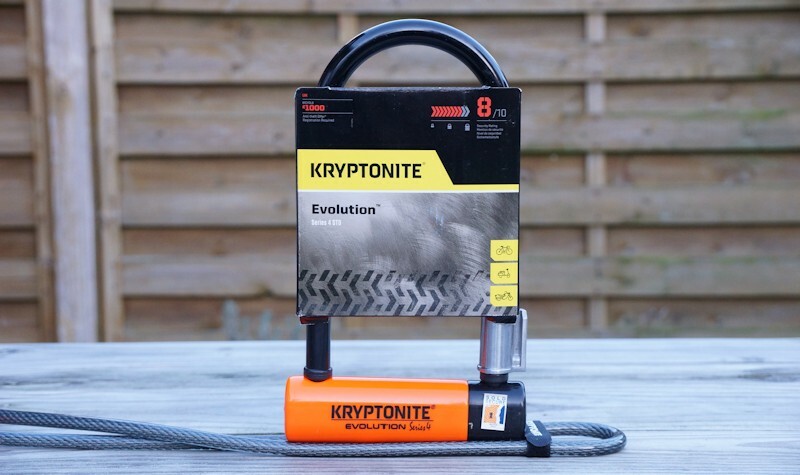 The Kryptonite Evolution 4 has a security level of 8 points and security is at the top in the list of safe locks from Kryptonite. The Kryptonite Evolution Mini 5 has for example a security level of 7, and the 7 mini and 9 mini also have a security level of 7. Anders sees it, however when Kryptoflex 1218 Key Cable from, here are the producers have a level of 2 to. If you want the padlock Kryptonite Evolution 4 crack, can proceed with an angle grinder. With the Flex and a metal blade, the lock is opened within 10 minutes. This of course depends on the used cutting blade and the angle grinder. With the bolt cutters, it still looks a little more difficult. The well 14 mm thick steel can not be easily severed like that. It is also true in this castle, it develops its maximum safety only when the bicycle is connected together to a fixed object. In public, hardly anyone will have the time and quiet, with an angle grinder to open the lock. By striking color you already recognize the padlock from afar. Our advice to you: Close your bike in the bicycle storage and bicycle shed from, so make sure you get to critical questions of your bike insurance from. Often bicycle also from the basement, the garage or the bike shed are stolen. The padlock is quickly mounted on the bicycle, and is ideal for use in the city, if you take just briefly go into business and parks the bike at busy places. Bikes without quick release front wheel can complete ideally with the padlock on bike racks. The castle is large enough to connect to the bicycle as a road sign, a street lamp would, however thick. 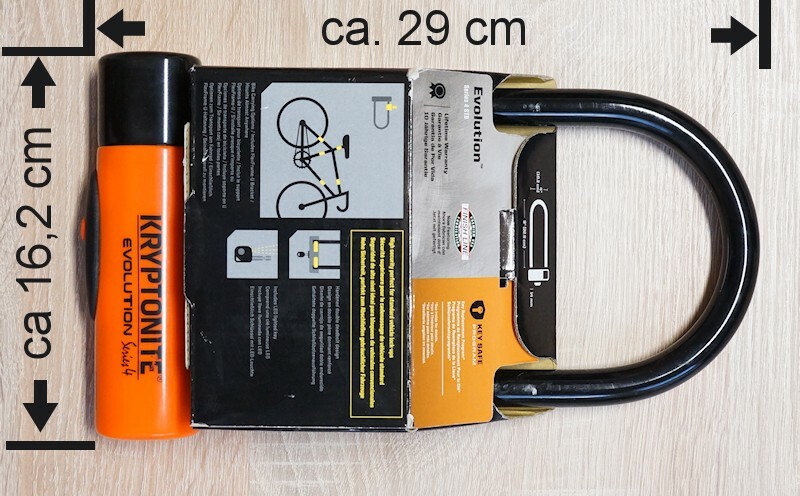 The weight from the Castle like scare at first glance, but considering that you want to protect your bike and compare the weight with other bicycle locks with a similar level of security, you quickly realize that you can hardly find locks that weigh less.